Anybody's who've been using OS X for a while can tell you that every OS release tends to break some applications. Mountain Lion is no exception. I've been loosely following Mountain Lion's beta releases and make fixes on News Anchor as necessary. However the latest GM release was a real breaker and we couldn't get a fix in time for the App Store due to Apple's being a lot slower than usual in reviewing apps and the sandbox-related rejections that they've been placing to News Anchor. 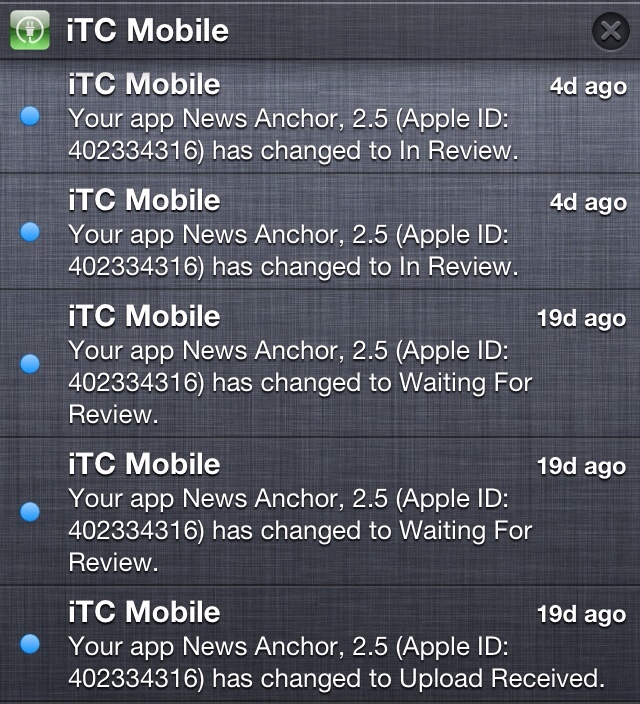 I've submitted News Anchor 2.5 initially at 27-Jul-2012 and it took one month for Apple to respond. When they did respond, they rejected it mostly because of sandbox-related issues, despite News Anchor having been sandboxed since far before the original deadline. It took some time for me to accommodate these changes and then re-submit the app. This again took somewhat longer than the usual time of a week. Yet again another slew of sandbox issues that we have to accommodate in News Anchor. Background refresh when News Anchor is not running. Generating audio podcasts files of channel episodes. If you've bought News Anchor from the Mac App Store, you can download a non-sandboxed version directly from us. As long as you have successfully ran the App Store version in your Mac at least once, the direct-download version should pickup your App Store receipt and lifts all trial limitations. Background refresh is done by having a “helper” app that runs without a window and triggers refreshes as necessary. This helper app is located inside News Anchor's primary application bundle. Unfortunately, because of the sandbox, this helper app cannot access News Anchor's primary data file and thus makes it impossible to update the data file without invoking the main application. Generating audio podcasts uses Apple's QTMovie library. Apparently this library doesn't work well inside a sandboxed application, as discovered by another Mac developer and reported in rdar://10644859. This issue was reported when OS X 10.7.4 (Lion) was current and Apple still haven't fix it in 10.8.1 (Mountain Lion). These issues are avoidable if only Apple have sandboxed their applications first before imposing it to 3rd party developers. That way they can come up with a more complete set of application entitlements as well as fixing other problems with their frameworks that comes up inside the sandbox. As of this date, even Apple's own App Store apps are not sandboxed. Not even the iLife and iWork suite of apps, that theoretically should work under the sandbox. If you're a Mac App Store customer, we are still working on News Anchor to get it to pass App Store reviews and get it working with Mountain Lion. However at this point and due to these issues, you might want to consider purchasing OS X apps directly from the developers if they make it available that way. You're definitely a power user, since you're reading this post, and you might not want your apps to lose functionality just because Apple's half-hearted sandbox implementation.